The following year the German Professional Championship came to Leipzig with eight entrants, all British professionals at German clubs: Cuthbert Butchart from Berlin, A J Chapman and D Crook the home club professionals at Leipzig, J B Holt at Hamburg, Ernest Warburton, Kitzeberg in Kiel, Arthur Andrews from Hamburg’s Wentorf-Reinbek club and James West of Bremen. Martina Limburger von Hoffmann who attended Rudolf Steiner’s first lecture in Leipzig and was much involved with the Anthroposophical Society visited Scotland with her son in 1914 and took some golf lessons in Oban. The next year she joined the Gaschwitz Club with her son and encouraged him to develop his talents. 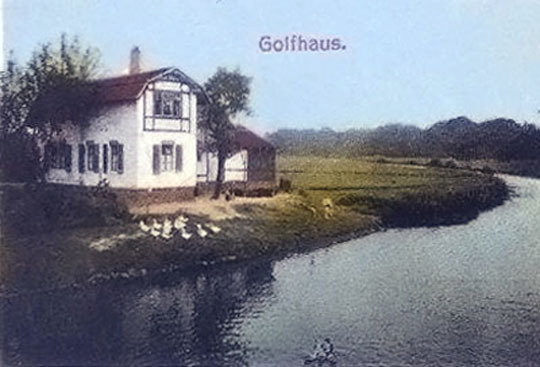 The fourteen year old boy was Bernhard von Limburger, eventually an outstanding amateur golfer and Germany’s most famous golf course architect. When he decided not to practice law and start a golf publishing house instead she supported his first steps financially. Duddingston, with which the Scotsman correspondent compared Leipzig in 1910, made much of appointing the first woman to their board in 2014. Martina Limburger was on the board of the Leipzig club from 1919-25.